The Southern Baptist Convention is scheduled to meet in Orlando June 15-16. Once again this year, Founders Ministries will host a breakfast before the opening session. At 6:30 AM in the Orange County Convention Center West Building, Rooms W303A-C on Level 3, we will enjoy breakfast and a message by RC Sproul. Dr. Sproul has been one of the most influential Christian preachers and teachers among Evangelicals of the last thirty years. Through his books, conferences, lectures, articles, Tabletalk Magazine and Ligonier Ministries, RC has been a leader in the resurgence of reformed theology that is taking place across denominational boundaries. Through his unwavering commitment to the doctrines of God’s sovereign grace he has become one of the leading reformers of our day. Dr. Sproul will speak on “The Cost of Reformation” during the breakfast. There are a limited number of tickets available and the breakfast usually sells out. Be sure to make your reservation today by going here. 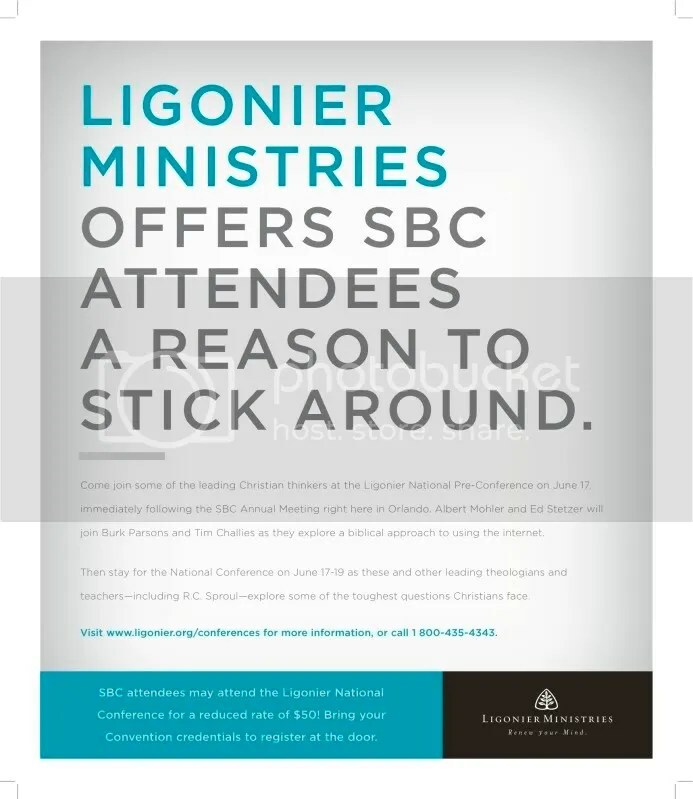 In conjunction with the SBC meeting, the good folks at Ligonier are making an incredible offer to Southern Baptists who participate in the convention June 15-16. The Ligonier Conference begins on Thursday, after the SBC. If you attend the SBC and want to stay for the conference, you can register for a super-discounted rate of $50. For more information click the banner below, or go here for details.